Domestication and taste preferences aside, when it comes to intelligence, pigs actually outsmart dogs. And cows are intelligent animals who have excellent long-term memories, develop friendships, hold grudges and even mourn the deaths of loved ones. So why do we draw an arbitrary moral line in the sand? Why do we love some animals yet eat others? According to the findings of a new study, this moral paradox is largely created by our own powers of denial. Calvin and Hobbes, six-year-old Calvin is chomping on a hamburger and asks his mother, "Is hamburger meat made out of people from Hamburg?" She replies, "Of course not! It's ground beef." Calvin looks incredulously at his burger and says, "I'm eating a cow? I don't think I can finish this." While the animal-loving Calvin quickly zeroes in on the moral quandary of eating meat, most people heedlessly consume all manner of sentient species. So why then are so many people happy to see pigs and cows used as daily food staples, yet revolted at the thought of eating dogs? (While dog meat is still legally eaten in China, the practice has come under heavy criticism recently.) Many would say it’s because dogs are human's best friend, while juicy burgers and sizzling bacon taste like greasy nectar from the gods. 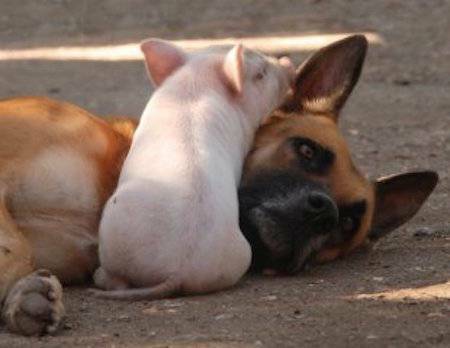 Domestication and taste preferences aside, when it comes to intelligence, pigs actually outsmart dogs. And cows are intelligent animals who have excellent long-term memories, develop friendships, hold grudges and even mourn the deaths of loved ones. So why do we draw an arbitrary moral line in the sand? Why do we love some animals yet eat others? According to the findings of a new study, this moral paradox is largely created by our own powers of denial. For the U.K.-based study, published in the journal Social Psychological and Personality Science, psychologists Jared Piazza at Lancaster University and Steve Loughnan at the University of Edinburgh quizzed a group of meat eaters about their dietary habits, using the intelligence of the animals they eat as the deciding factor. In order to establish that intelligence is in fact something humans value when choosing food, Piazza and Loughnan began by introducing participants to a fictional species from another planet. In total, 93.5 percent said they would not eat the animal if it possessed characteristics synonymous with high intelligence, while only 60.7 percent said they would be against eating the animal if it were unintelligent. One point for humanity. Unfortunately, the telling part of the study came when the same participants were asked to rate the “moral standing” of pigs and tapirs, both of which possess the same measure of intelligence as the fictional species. Overall, pigs received lower scores than the other two species across the board. In light of these findings, the authors concluded that people only really value an animal’s intelligence in a “motivated” manner; i.e., when it suits them. This is not necessarily a new revelation. In psychological terms, people are capable of accepting two or more positions that are contradictory to their beliefs or value systems to avoid the mental stress of cognitive dissonance. For the tricky area of eating animals, Loughnan coined the phrase "meat paradox." “We develop a moral belief for whatever reason, and then build a rationalization around it, like some pretty but flimsy facade,” writes Jesse Singal in New York Magazine, describing the act of creating cognitive dissonance in relation to the study. This is just how nature works. How can it be wrong if it’s such a normal part of our society? We need to eat meat for nutrition. It just tastes so damn nice. If these answers indicate anything, it’s that people like things the way they are. But beyond the morality matter, there is another looming reason humanity needs to seriously begin rethinking its heartless ways: the climate crisis. Last year, a landmark report released by the Intergovernmental Panel on Climate Change indicated that the exponential demand for meat in places like China will eventually drag global temperature over the dreaded two-degree Celsius mark. Put another way in a study conducted by the London-based think-tank Chatham House: By 2050, meat consumption will have risen by 75 percent and its production will take up the world’s entire carbon budget. The study concludes that "it is unlikely global temperature rises can be kept below two degrees Celsius without a shift in global meat and dairy consumption." So how do we change our behavior? “I like to ask people who’s for dinner, not what’s for dinner?" says Marc Bekoff, a professor emeritus of ecology and evolutionary biology at the University of Colorado and author of "Rewilding Our Hearts: Building Pathways of Compassion and Coexistence." It may seem strange to refer to meat with a pronoun, but Bekoff’s question serves as a means for shifting people’s consciousness to the reality of the food on their dinner plates: That steak was once part of a unique living being, someone with real emotions and an individual personality. It’s a partial antidote to the issue Piazza and Loughnan identified in their study. Bekoff likes to call this subcategory of humans Homo denialus. If you’re a fan of eating meat (like I am), you may find some consolation in the knowledge that at least there's a taxonomy now. Acknowledging this is a good start. Addressing the problem is the next step. Enter Brian Kateman, founder of the Reducetarian movement. How does one become a reducetarian? Simple really. By enjoying even one meatless meal a day—or a week—you’ve joined the movement, which has been popularized by the Meatless Monday campaign. “We need to engage people with a message that’s not going to intimidate or scare them,” said Kateman, who believes by creating a positive way that acknowledges the reality of our imperfect natures and encourages an ethical middle ground, slowly as a society we can make a meaningful difference. Psychologist Piazza has come to a similar conclusion. “One potential solution I am currently testing in my lab is whether self-persuasion might be used to help people overcome their tendency to respond defensively to information about animals they consume as meat,” he said. He believes that by allowing people to become familiar with the concept of eating less meat themselves, rather than being told to do so, there’s an improved chance they will eventually incorporate a meat-free diet into their lifestyle. “So far the results look promising, but there is much work still to be done,” he said. After all, denial is one of the most powerful tools humans use to justify or rebuff just about anything—even denial itself. "It's not denial," Calvin and Hobbes cartoonist Bill Watterson once quipped. "I'm just selective about the reality I accept." Robin Scher is a freelance writer from South Africa currently based in New York. He tweets infrequently @RobScherHimself .